Spaceify is an edge computing smart space ecosystem that seamlessly integrates your physical space with the web. With Spaceify you can give web apps controlled access to resources such as big screens, sensors and lighting in your space. By running a Spaceify Edge Node in your home network you can enhance existing web pages to interact with the resources in your home. For example, you can enhance vimeo.com with a Spacelet that can play videos on your big-screen TV. You make your home network truly yours with Spaceify! It is highly likely that the first question any visitor will ask upon entering a meeting room is: "Is there a WiFi available?" and the second: "How can I connect to your projector?" Spaceify can provide an easy answer to both of these questions. The visitor can both connect to the Internet through the Spaceify Edge Node and show his/her presentation using the presentation viewer application that is found on the Edge Node. No more hassling with the VGA/DVI/HDMI cables that never work! Spaceify Edge node is by definition a powerful computer located one hop away from WiFi users. This makes Spaceify an ideal gaming platform. A powerful computer means stunning graphics, and one hop WiFi connection means low controller latency. 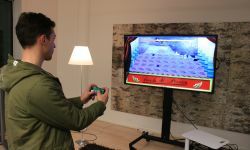 The game is displayed on a big screen that is connected to the Edge Node. 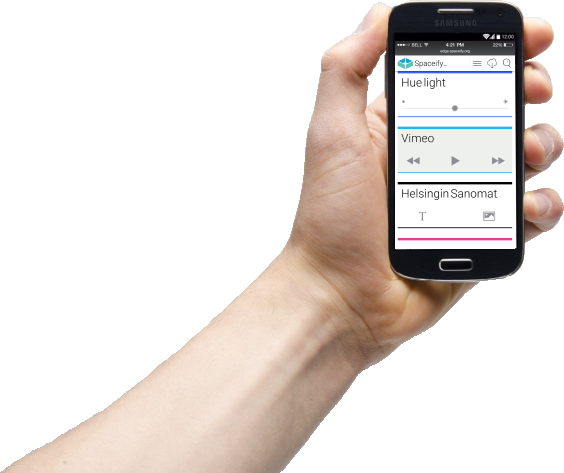 You don't need to install any apps on your phone. 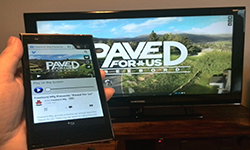 Just connect to the WiFi and your mobile device becomes a game controller! Spaceify is open source software, and runs on standard x64 hardware. You can start using it NOW. 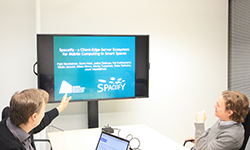 The Spaceify ecosystem was born as a collaborative effort of researchers from Helsinki Institute for Information Technology (HIIT), Aalto University, University of Helsinki and University of Florida. In late 2014 Spaceify was released as an open source project on GitHub under the MIT license. The original Spaceify team continues active development of the ecosystem, but we also invite new developers to join us. A good way to get started is to publish Spaceify packages on the Spaceify package repository!